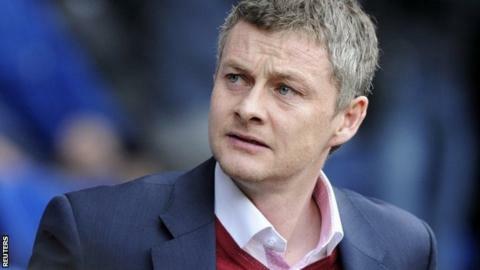 Cardiff City manager Ole Gunnar Solskjaer has stepped down after less than nine months in charge. Veteran defender Danny Gabbidon and Scott Young are in temporary charge. Before the announcement was made, BBC Scotland learned Dundee boss Paul Hartley, 37, had rejected the possibility of succeeding Solskjaer. Welshman Tony Pulis is the favourite with most bookmakers, but the 56-year-old former Crystal Palace and Stoke boss told the BBC he has not been approached. Owner Vincent Tan said: "Ole was hired by Cardiff City on our understanding and belief that he would help us fight relegation from the Barclays Premier League. "After the club was relegated, many people advised me to let him go, but I decided to keep Ole on for the Championship season. "Regrettably our recent results do not justify Ole's continued role as manager at Cardiff." Tan described Solskjaer as an "honest and hard-working professional" but added: "Unfortunately the football results were not in his favour." Solskjaer said: "I want to thank Vincent for giving me the opportunity to manage Cardiff City. "He has my full respect and I really wish him all the best in his pursuit of making this football club successful." After the defeat by Middlesbrough, Solskjaer took the blame for the club's poor run of form. "I should get better results than we've had in the first seven games," he said, after his side were booed off the pitch at half-time and full-time. Former Bluebirds captain Jason Perry told BBC Radio Wales the board and Tan had to take some responsibility. "It was the wrong appointment for Cardiff and the wrong club for Solskjaer," said Perry ahead of the Norwegian's departure. "If you're manager or a coach you have a central strategy and you work on that. But he's still trying to find his first 11 and you can't do it, it doesn't work. "The table tells you that, the results tell you that and unfortunately Cardiff thought he was the right man for the job and I want to know why."